The Ottomans declined in power during the 19th century, and formed an alliance with Germany in World War I (1914-1918) with the aim to regain some of it. The Battle of Gallipoli, 1915-1916, also called the Dardanelles Campaign, was victorious for the Ottomans and disastrous for the British and the French. Soon after the naval battles in March 1915 Winston Churchill, then British Lord of the Admiralty, was dismissed from his cabinet position and nearly ruined his political and military career forever. The Allied Powers, primarily Britain, France, and Russia up to late June 1917, were seeking control of the sea route from Europe to Russia. The U.S. entered WWI on April 6, 1917 and the first U.S. troops arrived in Europe June 26, 1917. For the Allied Powers, U.S. military and financial support was crucial. Britain also had a significant interest in Palestine, as was made clear with the Balfour Declaration Nov. 2, 1917, in which Britain indicated its intention to create a national homeland for the Jews in Palestine. The Zionist movement had its strongest support in Britain since the 19th century, with Prime Minister Lloyd George, 1916-1922, being one of Zionism’s staunchest supporters. This further fuelled the British push to persuade the U.S. to enter the war, because as of 1916, the Germans and the Ottomans were clearly the victors. But with U.S. assistance the Allied Powers were finally able to win the war in 1918. The stage was then set for Britain, France and the U.S. to establish their territorial influence and control throughout the Middle East. These interests were set in place after an arduous six-month long period of negotiations and maneuvering from Jan. 18, 1919, concluded with the Treaty of Versailles, June 28, 1919. The current Caliphate declared by ISIS in June 2014 has seized lands in both Syria and Iraq, taking advantage of an area drastically weakened and destabilized by the U.S.-led invasion of Iraq in 2003. What followed soon after was sectarian violence in Iraq and civil war in Syria. Severe drought in the Tigris-Euphrates river basin, 2006-2009 created additional civil unrest when so many Syrians had to abandon their farmlands. Further tensions between Middle Eastern nation-states occurred from government water policies unwisely planned or coordinated, or perhaps intentionally favoring one nation to the detriment of others. For instance, in the 40 years since it built its dams and hydropower, Turkey has cut water flow to Iraq by 80% and to Syria by 40%. ISIS is especially proud in its claim to have erased the previous boundaries of the nation-states of Syria and Iraq that were drawn up in the Sykes-Picot Agreement. To trace the anger and resentment of Muslims towards non-Muslim Western nations, we can go back as far as the Sykes-Picot Agreement of 1916, the events following World War I and the Treaty of Versailles (June 1919), when Arab and Kurdish military resistance to British or French rule was common, and the colonial powers often underestimated the power of local armed tribesmen. But to cite a more recent antecedent to the rise of ISIS we know that the U.S.-led invasion of Iraq and its systematic dismantling of the Sunni military and intelligence structures left hundreds of thousands of Sunni Ba’athist militia with no power and no jobs. These same Ba’athists, with their advanced military training, have become the pillar of ISIS. And though the Ba’athist party was secular Muslim, some of their key slogans came from Islamic scriptures, such as “A single Arab nation with an eternal message” and “Unity, freedom, socialism.” The first phrase reflects Pan Arabism, which much like Pan Germanism in the pre-WWI period, aimed to unite Arab peoples in a single nation or region, while “liberty” did not mean individual liberty so much as national independence and freedom from imperialism. But World War I was the beginning of the end for the previous Caliphate, and the start of Western nations’ serious interest in controlling the Middle East, the U.S. being the necessary military and financial ally for Britain and France to achieve a victory and their desired goals, especially in the Middle East. SOURCE & COMMENTARY: https://en.wikipedia.org/wiki/World_War_I Exact time of day unknown. 12 noon used. World War I began on July 28, 1914 when Austria-Hungary declared war on Serbia; it ended on Nov. 11, 1918. Nine million combatants and 7 million civilians were killed. The peace treaty (Treaty of Versailles, or Paris Peace Treaty) was concluded on June 28, 1919. Though 21 nations were in attendance, from Jan. 18, 1919, the major power brokers were Britain, France, Italy and the U.S. However, U.S. President Woodrow Wilson was less successful in achieving his stated aims, and considered naïve and overly idealistic by the European colonial powers, Britain and France. Extremely harsh terms were meted out to Germany, setting the stage for Germany’s revenge and the rise of Adolf Hitler. These themes have longer to gestate and/or fester when there is a longer period of time with transiting Venus and Mars passing through the same sign. This occurred in the weeks leading up to the start of WWI and just after its official beginning on July 28, 1914. Spanning over 3 ½ months in 1914, the dates are: July 9 to Aug. 2 (Leo); Aug. 4-31 (Virgo); Sept. 19-30 (Libra); Nov. 1 to Dec. 12 (Scorpio). Several Graha Yuddhas (Planetary Wars) occurred during this time, the most pivotal one in late July-early Aug. 1914, when a young Adolf Hitler joined the military for the first time, having just won his petition as an Austrian citizen to fight for Germany, this after successfully avoiding military service in Austria. Hitler’s natal Venus and Mars are in Aries in a Graha Yudda in Venus-ruled Bharani nakshatra. 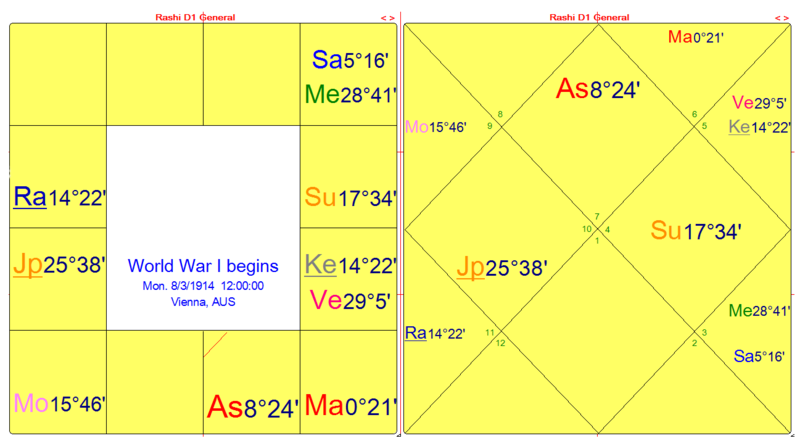 In the chart for the start of WWI, Venus and Mars are together in Purva Phalguni nakshatra, a Venus-ruled nakshatra in which these two planets are rendered even more rajasic (i.e. desire-ridden and passionate, pulsing for action). With tr. Venus and Mars on the eclipse axis (Rahu-Ketu), the propensity for turbulence and spiraling out of control is pushed further. And on Aug. 21, 1914 a total eclipse occurred at 4:55 Leo in Magha nakshatra, symbolized by the throne. Leo is the most royal of the three fire signs, all of them being kshatriyas (warriors, with royal associations). Between 1915 and 1918, three prominent royalty lost power: Kaiser Wilhelm II of Germany and Prussia, Czar Nicholas of Russia and King George V of England. The end of WWI would mark the end of the German, Russian, Ottoman and Austro-Hungarian empires. Britain’s Empire was not yet over, especially when in June 1919 it won new coveted control over Middle Eastern territories from Iraq to Palestine. France occupied Lebanon in 1917 after the Turks’ defeat, and was given a mandate over Syria in April 1920. Britain would soon share its pre-eminent power status with the U.S., from whom it had borrowed heavily to fight and win WWI. In the larger scheme of things, Jupiter’s weakened position in Capricorn in the WWI chart, and generally in earth signs, presages the EARTH-sign dominance of the Jupiter-Saturn conjunctions from Sept. 1921, but with an initial transition period, the FIRE to EARTH Mutation period (1901-1961) before the JU-SA conjunctions begin to occur more regularly in EARTH signs from 1961 to 2199. The EARTH-dominant period would bring more focus on areas over which Saturn rules: business interests, material security, consolidation of material resources and powers, favoring transnational corporations, especially those specializing in weapons of defense and/or pharmaceuticals. At the same time, Jupiter’s significations would be gradually weakened, more noticeably from 1961 onward, though with various factors in place from the first EARTH conjunction Sept. 9, 1921, the JU-SA conjunction in Virgo. Jupiter’s arenas encompass the nation-state, urge for national identity and patriotism, humanitarian and ethical concerns, law and lawyers, religion and its leaders, higher education and teachers, journalism and journalists, publishing industries, urge for political and individual freedom, and royalty or ruling monarchs. SOURCE & COMMENTARY: Edith Hathaway, In Search of Destiny: Biography, History & Culture As Told Through Vedic Astrology, © 2012, p. 15. Chapter 1 (pp. 1-56) contains further discussion of the FIRE, EARTH, AIR and WATER periods, covering a 1000-year period of history and culture: 1405 to 2399. Included are both Annotated and Unannotated Time-lines giving the JU-SA conjunctions in each sign, by degree and nakshatra, with special reference to the triple conjunctions whenever they occur, as they confer greater intensity on any period. The previous WATER-dominant period favored expansion of trade by sea voyages, also royal and religious authority. We have already noted that the Ottoman Caliphate was strongest during the 16th and 17th centuries, as was the Papacy, and this was during the WATER-dominant period, when also some of the greatest religious art and architecture was produced. The FIRE-dominant period favored royalty, patriotism, and nationalistic fervor, with less focus on religion per se. Also, the 20-year periods following JU-SA conjunctions in FIRE would be more generally favorable to those seeking independence as nation-states. For example, India finally gained independence just after WWII (1939-1945), following the triple JU-SA conjunctions in Aries (1940-1941), though many factors were in place for this to happen soon after the end of WWI. But the JU-SA conjunction in Virgo in Sept. 1921 favored corporate and business interests over those of groups seeking independence as nations, as would the larger EARTH-dominant period from 1961 to 2199, when these items became more favored: iron, lead, zinc, black metals, coal, fuels – especially oil, gasoline, chemicals, inferior grains, and leather goods. Britain obtained an interest in the Anglo-Iranian Oil Company on August 14, 1914, just 18 days after the start of WWI. And within a few decades, the richest oil fields in the world would be found in the Middle East, in Saudi Arabia, Kuwait and Iraq. When the fledgling automotive and airplane industries took off in the early 1920s, the oil-dependent Western powers found further reason to seek control of commercial and business interests in the Middle East. At the same time, oddly paradoxical alliances were formed with Saudi Arabia, Kuwait, and Qatar (formerly part of the British Empire until 1971). These are still the richest oil nations in the Middle East, and – ironically, the biggest financiers of military weapons to Al Qaeda and various other groups of radicalized Sunni Muslims, including ISIS, the new Islamic State. Turkey also sends arms to Sunni jihadists, and Saudi Arabia is the home of Wahabism, an extreme and rigid form of Islam practiced by Sunni Muslims, one of whom was the radicalized Osama bin Laden. The rapid growth of the global military weapons industry after WWII (the Atomic Age) and the new global balance of power made it clear that any group, whether national, ethnic, or religious, needed to acquire major weapons in order to acquire real global political power. The five permanent members of the United Nations Security Council are the nations considered the greatest victors in WWII. And though the United Nations was formed in Oct. 1945 to avoid or limit war between nations, these are the same nations who first acquired nuclear weapons: the U.S. (1945), Russia (1949), Great Britain (1952), France (1960), and China (1964). One might ask what chance a new Caliphate has when founded in the midst of the EARTH-period, not known for its emphasis on religion. But the new Caliphate is also oil-funded and if it can deliver economic security and restore a sense of personal pride in a world that has turned its back on so many of the undereducated, underemployed youth, then ISIS may well succeed where other nation-states have failed to make significant progress, especially in a war-torn, destabilized region. France in particular, with 8% of its population being Muslims, is proving itself a soft target, especially as a largely secular, anti-religious culture into which the Muslim population has not been well integrated. And since ISIS recruits hail from all over the world, from both rich and poor nations, we have to consider that ISIS recruits coming from rich nations may have lost their sense of purpose in a consumerist culture and yearn for something more meaningful. For this reason they can and do succumb to the promise of ISIS to create a more pure (in this case Islamic) world. Even if most Muslims are considered “moderate” and strongly repudiate the brutal tactics of ISIS, the message of young Muslims once again fighting off Western empires cannot be lost on them, especially young Iraqis and Syrians whose financial poverty is a key factor. 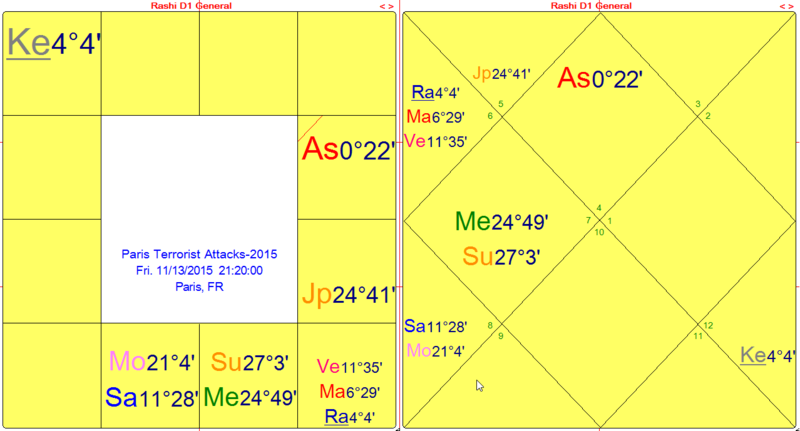 The most recent JU-SA conjunction (May 28, 2000) was at 28:52 Aries, in the war-like nakshatra of Krittika. The next conjunction Dec. 21, 2020 is at 6:20 Capricorn, in Uttara Ashadha. Though the EARTH period has seemed to engender perpetual war, most of its profits go to the largest industries, the defense and pharmaceutical industries, and also illegal weapons and illegal drugs. It is unusual in any century to have two triple JU-SA conjunctions within 40 years, and it will not recur until the 23rd century. But the 20th century gave us triple FIRE conjunctions in Aries (1940-1941) and triple EARTH conjunctions in Virgo (1980-81), bringing extra intensity and acceleration to many areas of life, and fuelling a revolution in both weapons (the Atomic Age) and information technology (the Information Age). Not only do weapons now exceed the power of those of any era in human history, but information too is the new hot commodity, especially with the World Wide Web in 1990, the personal computer, cell phone, and related technologies connecting people everywhere, while also making them vulnerable to surveillance and military technology. Meanwhile, profits and bottom-line financial considerations (Saturn) have more often gained ascendance over the public good (Jupiter), when corporate interests dominate over nation-states and the citizens they are supposed to represent. In such a way, perpetual war is generated. British author and historian Tony Judt (1948-2010) has said that “Privatization has led to a moral catastrophe [and] the collapse of the public spirit.” ISIS has responded to this crisis in a perverted way, by enforcing its hold over communities through brutality, fear, intimidation and outright slavery. Nevertheless, especially in a region where ethnic, religious, or national identity has become so problematic, and where even as a refugee there is no guarantee of protection or safety, ISIS has managed to magnetize its recruits and followers, notably with sophisticated use of the Internet and digital technology. SOURCE & COMMENTARY: https://en.wikipedia.org/wiki/Timeline_of_the_2003_invasion_of_Iraq. The first U.S. attacks on Baghdad began March 20, 2003 at 5:30 am local time, Baghdad, Iraq. Voted through U.S. Congress on the premise that Iraq’s Saddam Hussein had weapons of mass destruction (WMD), this was soon proved to be false intelligence, and for a war that was illegal and criminal at the outset, at least by the principles of the Geneva Conventions, 1949 and the Nuremburg Trials of 1945-1946. The United Nations did not approve of the attack, but had no legal leverage to stop it. Fixed signs are featured in this chart, with only classic malefic planets in the angles: Saturn, Rahu and Ketu, and Aquarius Ascendant. This factor tends to give a long-term effect for the actions performed at this time. The whole basis of the Iraqi society was torn apart, including its infrastructure, as shown by classic malefics Saturn and Rahu in the 4th house of foundations. Jupiter, lord of the 2nd house of financial income is in the 6th house of disputes and litigation. Tens of billions of U.S. dollars were wasted or lost. At one point $9 billion U.S. dollars suddenly disappeared, as did many valuable local cultural artifacts. Such extraordinary results can come from an exalted Jupiter, which though it brought a huge influx of American funds and manpower, most of it was military and weapons-oriented (also 6th house), with many large military bases built for U.S. soldiers, and a very large (104-acre) U.S. embassy compound in Baghdad. By mid-May 2005, U.S. soldiers occupied 106 military bases in Iraq, ranging in size. 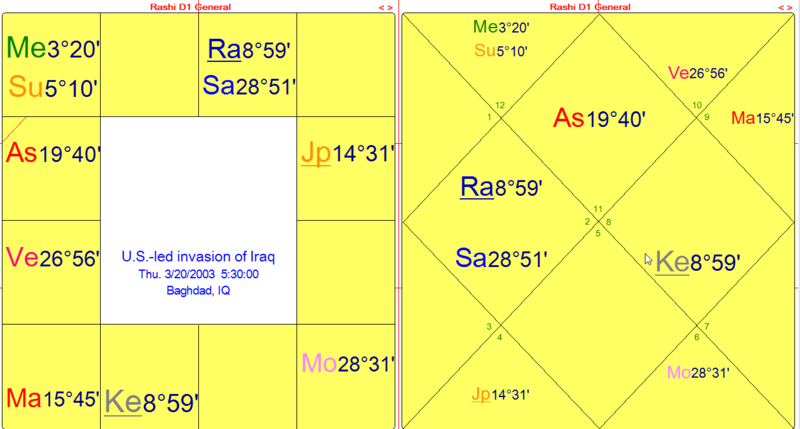 The fixed emphasis, with Saturn-Rahu in the 4th house, hints at a longer-term U.S. presence in Iraq than originally stated, including during Rahu Dasha (June 29, 2007 to June 28, 2025). The major beneficiaries of American largesse appear to be chiefly U.S. defense contractors and mercenary armies, not Iraqis, except for a corrupt few. With the Moon in the 8th house of this chart, the people of Iraq would suffer irretrievably from this moment onward. Once again, as in the chart for the start of World War I, we see the energies of tr. Venus and Mars intertwined. They share an important Nadi yoga (exchange of nakshatra lords), continuing the theme of the passionate quest for power. Adding to the complexity, Venus in Capricorn exchanges sign lords with Saturn in Taurus, since Venus rules Taurus and Saturn rules Capricorn. This gives a strong business component to the whole endeavor. But since Rahu is with Saturn in Taurus, we know that the true business motives for invading Iraq would be kept under wraps for as long as possible. Any accusation that the invaders were after Iraq’s abundant oil reserves were summarily dismissed. But Saturn is nakshatra lord for four planets, Mars for three planets and Venus and Sun for the remaining two, and this should tell us how much control Saturn has here, including its aspect to exalted but retrograde Jupiter in Cancer. 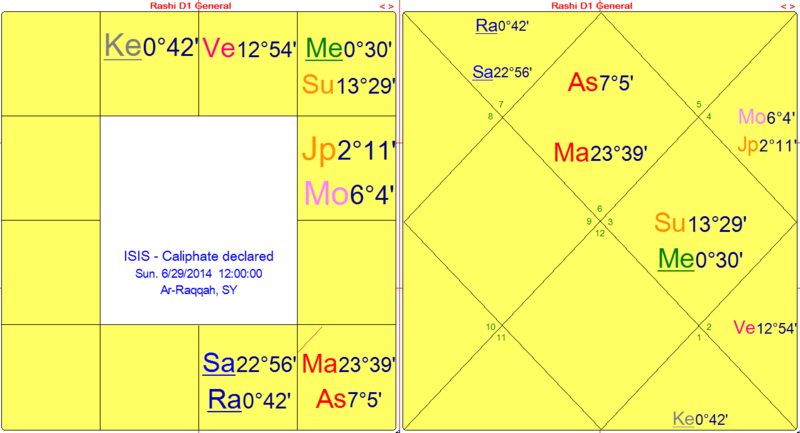 Also, Saturn with Rahu insures the secretive, calculating components that the broader public is unaware of. In his book Winning Modern Wars, 2003, p. 130, General Wesley Clark describes how in Nov. 2001, soon after the attacks of Sept. 2001 on U.S. soil, he was informed at the Pentagon of plans in the works for “a five-year campaign… [to include] attacks on seven Middle Eastern countries, beginning with Iraq, then Syria, Lebanon, Libya, Iran, Somalia and Sudan.” Coincidentally, each of these countries has been wracked with violence and attacks since 2001, with Iran suffering heavy economic sanctions for many years. Though the stated aim was to rid Iraq of its WMD and “liberate the people of Iraq” from a cruel dictator, the havoc created by the U.S.-led invasion can in some ways be foretold from this chart. Even the Vimshottari Dasha sequence tells an important story. Rahu-Saturn sub-period ran from Aug. 3, 2012 to June 10, 2015, marking the rise of ISIS, when the U.S. thought it had conquered them as of 2006 and again in 2011. But as noted earlier, the same Iraqi Ba’athists who were disbanded by the U.S. occupation in late May 2003 eventually gravitated to ISIS. Other U.S.-trained and equipped Iraqi militia have also migrated to ISIS, along with large numbers of military vehicles, equipment and weapons supplied by the United States. Transiting Jupiter exalted in Cancer is near its Stationary Direct degree at 14:09 Cancer (April 4, 2003), intensifying its effects. As mentioned earlier, the effects of Jupiter are already more exaggerated and extravagant in its sign of exaltation, especially where Jupiter is controlled by Saturn with Rahu here, being both aspected by Saturn and residing in Pushya nakshatra, owned by Saturn. Note too that Jupiter’s orbital cycle is 11.9 years. Tr. Jupiter returned to sidereal Cancer June 20, 2014 (to July 14, 2015), marking some important outcome from the invasion. Within 9 days of the Jupiter return, ISIS declared itself a Caliphate: on June 29, 2014. The fires of religion and war-mongering are easily ignited with Jupiter in Cancer, especially when Mars is involved, as it is in this chart for the U.S.-led invasion of Iraq. Tr. Mars in Sagittarius aspects Houses 4, 7, and 8 from itself, aspecting tr. Sun and Mercury in Pisces and tr. Jupiter in Cancer. Previously, tr. Jupiter was in Cancer from July 6, 2002 to July 31, 2003. This covered the lead-up to the U.S.-led invasion of Iraq, despite opposition from the United Nations and from millions of people across the world who joined large-scale protest marches from Sept. 2002 through March 2003. Meanwhile, corporate news media, buttressed by eager defense industries, joined in lock step with then U.S. President George W. Bush and the many willing or hawkish politicians who followed suit. Since that time, there are approximately 20 million more displaced people in the world, with a current total of 60 million. This comes largely from those seeking refuge from war-torn countries in the Middle East and Africa, starting with Iraq in 2003. Many of them went initially to refugee camps in Turkey, Lebanon and Jordan, but these camps are currently overpopulated and vastly underfunded, with minimal food distribution, little to no paid work for the adults and little to no education for the children. Small wonder the refugee crisis inevitably spread into Europe and beyond. Saddam Hussein’s Iraq up to March 2003 was secular, but the invasion of Iraq in 2003 and the cascade of U.S. foreign policy blunders that followed unleashed the wrath of Sunni Muslims and even broader retaliation and revenge by extremist Islamic sectors, opening the door to the more strict and purist jihadi Muslims to seek broader powers within the region and to punish their invaders and former colonial masters, along with others perceived as a threat to Sunni Muslims, including Shia Muslims. Claiming large swaths of territory in Iraq and Syria, ISIS declared itself a Caliphate on June 29, 2014. This means it declares its religious authority over Muslims around the globe, with the aim to bring most of the Muslim-inhabited regions of the world under its direct political control. The first thing to note astrologically is the Jupiter return to the chart of the US-led Invasion of Iraq, as mentioned above. Jupiter is the planet most associated with religion and its leaders. The water signs are Brahmins, i.e. priests, spiritual teachers, and those seeking higher consciousness. Meanwhile, all the planets are spread out over six houses (or signs). This bodes well for ISIS being able to claim authority and have success establishing its stated goal, though of course the organization has had many names since its inception in 1999, and periodically had allegiance with Al Qaeda. But even after repeated efforts by the U.S. to destroy ISIS and other jihadist groups, notably in 2006, the return of Jupiter (planet of Dharma) to the 2003 invasion chart is when ISIS gained titular strength and declared itself a Caliphate in June 2014. This was only 9 days after tr. Jupiter had entered Cancer, and was still in the Vargottama phase, i.e. the first 3 degrees 20 minutes of a Chara sign, when it repeats in the Navamsha and is considered strong. For some 8 months ISIS had been negotiating for a united front with Al Qaeda, but this failed as of Feb. 2014, when Al Qaeda disagreed with the brutal methods of ISIS, among other factors. Previously, though Syrian rebels had captured Al Raqqa, Syria in March 2013, by May 2013 ISIS was beginning to seize control of the city. And by Jan. 2014 it had complete control of Al Raqqah, ousting or executing any uncooperative Syrian rebels or citizens. This was the city they chose as the center for the Caliphate. Since there is no confirmed time of day on June 29, 2014, we have no confirmed Ascendant, though Moon’s Ascendant can always be used, and in this case it is most powerful, being in Cancer (the sign the Moon owns) in the auspicious Pushya nakshatra, which nourishes and promotes growth. Moon is conjoined with exalted Jupiter also in Cancer. Whenever Jupiter is in an important Ascendant, it is considered to remove 1000 doshas (flaws). Five planets are especially strong due to being either exalted (Jupiter in Cancer, Saturn in Libra), or in their own sign (Venus in Taurus, Mercury in Gemini and Moon in Cancer). But the Moon-Jupiter in Cancer describes the desire to unite as a family, in this case a family that calls itself Islamic, and Jupiter in the Moon’s Ascendant gives greater protection to this organization than their enemies might welcome. It may be more difficult to conquer ISIS than anyone supposed. The cruelty of their methods is shown in part by Saturn and Rahu conjoined in Libra, similar to the U.S.-led invasion chart, with Saturn and Rahu conjoined in Taurus. Another quality shared with that chart is that Saturn (with Rahu’s influence) again aspects Jupiter, this time from the 10th house aspect. Thus, all the religious zeal of exalted Jupiter in Cancer is pushed by Saturn towards a business and administrative orientation. Indeed, ISIS has established its civic and military authority, ruling and regulating both through fear but also through attention to details, collecting taxes and fees where appropriate, and punishing those caught cheating or stealing. Recruits are trained, armed, well paid, and given a sense of ongoing reliability, even if severe methods are used at times. Many people have reported they feel safer under ISIS than under the Syrian government, but this was before the bombing started from Russia and other Western nations. However, Jupiter is strong in its own nakshatra, Punarvasu, and Saturn is also in Jupiter’s nakshatra, Vishakha. Mars is strong in Virgo, disposited by Mercury Retrograde in Gemini. Mercury Retrograde could show a willingness to regroup, review, and reconsider new pathways. There is very little fixity in the chart, and we cannot be sure of the Navamsha chart, so it is not clear whether ISIS will in fact be able to expand and endure, but with such a relatively strong chart, they may be able to outwit and outlast their opponents, even if outmanned and outgunned. This is what happened with the Taliban in Afghanistan. Other than that, it is hard to predict how much damage they will continue to inflict on other nations around the world, or whether that might stop if they gain some of the territory and authority they are seeking and curtail their violent methods. Syrian President Bashar al-Assad has thus far left them alone, according to most reports, and has had a pragmatic approach to dealing with them, since ISIS controls the oil sectors and can be relied on to handle administrative operations smoothly and efficiently. Assad is more concerned with the rebel forces: the Free Syrian Army, Al-Nusra and other Al Qaeda affiliates. SOURCE: http://www.nytimes.com/interactive/2015/11/13/world/europe/paris-shooting-attacks.html?_r=0 A Time-line is given for each of the attacks on Friday, Nov. 13, 2015, along with a map of locations where the attacks took place in Paris. The first attack, at the national stadium in Saint-Denis was at 21:20 on Nov. 13, 2015. In all there were 130 people killed and between 352 and 368 injured. Seven attackers worked in three teams. All were killed, mostly by explosive belts they self-detonated. One Belgian accomplice remains on the run, while other suspects have been arrested in Belgium and France, and another killed in a police raid in Paris. In fall 2015, through its foreign recruits, ISIS stepped up its attacks on civilians in many places, in Turkey, Lebanon, Egypt (the Russian airliner), and most recently France, where some experts say ISIS wants to provoke a civil war. ISIS profits from civil discord, civil wars, and weak governments. ISIS claimed responsibility for the bombing of a Russian passenger plane on Oct. 31, 2015 over Egypt. All 224 people on board were killed. After the Paris terrorist attacks on Nov. 13, 2015 French President Hollande declared a State of Emergency for three months, closed the national borders and declared war on ISIS. Other nations increased their security measures. In the U.S. Presidential campaign Hillary Clinton became even more hawkish, and most of the Republican candidates became more fierce and outspoken about the need to attack ISIS and Syria, also the need to refuse any Syrian refugees, though some said Syrian Christian refugees would be more acceptable to the U.S. In such a way the fires of xenophobia and Islamophobia in the U.S. started to burn hotter, just as the fire for war with Germany in 1917 burned hotter with rage against Germany and all things German, aided in that case by the well-funded Committee on Public Information (CPI) in its project to influence public opinion, April 1917 to Aug. 1919. President Woodrow Wilson wanted to persuade Americans of the merits of the U.S. entering WWI, especially when a large segment of the population were German immigrants loyal to Germany and most citizens then favored neutrality. But as a result of this campaign, anti-German sentiments became so ingrained that it was easy to reignite them in the 1940s to gain public support for U.S. entrance into World War II. Likewise, ISIS recruits may have launched a campaign of strategic disinformation at the time of the Paris attacks in Nov. 2015. Leaving a Syrian passport in the vicinity of the Paris attacks was clearly designed to provoke fear and concern about Syrian refugees and foment even more heated debate about whether refugees from war-torn countries like Syria should be allowed into Europe or anywhere. In fact, even though many of them had trained in Syria, none of the attackers were Syrian, all had EU identities, and the Syrian passport was probably stolen from a dead Syrian soldier. With Mercury in Libra in Parivartana yoga (mutual sign exchange) with Venus in Virgo, Mercury behaves partly AS IF it is in Virgo with Mars and Rahu. Mercury is exalted in Virgo, showing mental dexterity and adaptability, but conjoined with Mars and Rahu, it can be used towards violent ends. No doubt the terrorists had been well trained in the use of weapons and explosives, and were totally prepared to blow themselves up rather than be captured. Mars-Rahu accounts for such extremes, though with three planets debilitated (Sun, Moon and Venus), the attackers were working at some disadvantage. They had hoped to inflict far more damage at the stadium during the soccer match, but instead one attacker blew himself up outside the stadium. Even so, the fact that Venus (day lord of Friday) is Neecha Bhanga Raja yoga, recouping from its debilitated state and sure to be elevated – this gives more power to the chart as a whole and to the rajasic Venus-Mars-Rahu, thus the power to inflict violent acts on innocent civilians, symbolized by Moon in the 5th house of sports and entertainment. But the Moon is debilitated in Scorpio and pulled down by Saturn, planet of grief and restrictions. However, the chief violence ensues from the rage and passion found in the Venus-Mars-Rahu combination in Virgo, bringing us back to the initial theme of Venus conjoined with Mars that we have been exploring throughout these charts, from the first chart presented of the start of World War I on July 28, 1914 through the U.S.-led invasion of Iraq, and finally this chart of the Paris terrorist attacks on Nov. 13, 2015. With such a sequence of charts, one might well wonder whose method of attacks holds superiority on moral grounds, if any. ISIS is infamous for its brutal attacks, and needs to be dealt with as a totalitarian entity. But the ongoing U.S. military drone program, with its targeting killings by unmanned aircraft lacks precision and has become “a major driving force for ISIS and other terrorist groups,” according to US Air Force service members with more than 20 years of experience. With its multi-billion dollar arms sales to Saudi Arabia, Pakistan and other countries with poor human rights records, the U.S. further fuels the cycle of violence in the Middle East and elsewhere. Edith Hathaway is an international consultant in practice since 1980, author, teacher, and lecturer of Vedic astrology and among the few contemporary astrologers trained and certified in systems of both East and West. She was a Founding member of the American Council of Vedic Astrology and since 1992 has served as a faculty and board member of both the American Council and American College of Vedic Astrology. She has received numerous certificates and awards from leading astrological organizations, including the Jyotish Brihaspati, the highest award given by the Council of Vedic Astrology (CVA). Her articles and lectures are available at her website www.edithhathaway.com, along with testimonials and reviews of her most recent book, In Search of Destiny: Biography, History & Culture As Told Through Vedic Astrology, 2012. It is available in both paperback and Kindle e‐book versions at Amazon USA, Amazon Europe and elsewhere. See her website store for her lectures on video or mp3s along with accompanying PDF files.